Luxurious New Spanish Colonia! 7th Night Free! Welcome to Casa Las Palmas, a stunning new Spanish Colonial style villa on the Caribbean Island of Isla Mujeres. Beautifully designed and executed for comfort, CasaLas Palmas improves and enhances this wonderful little island to provide an oasis of calm and tranquility for the villa guests - the perfect place to relax on holiday and enjoy luxury, tranquility and convenience, island-style! 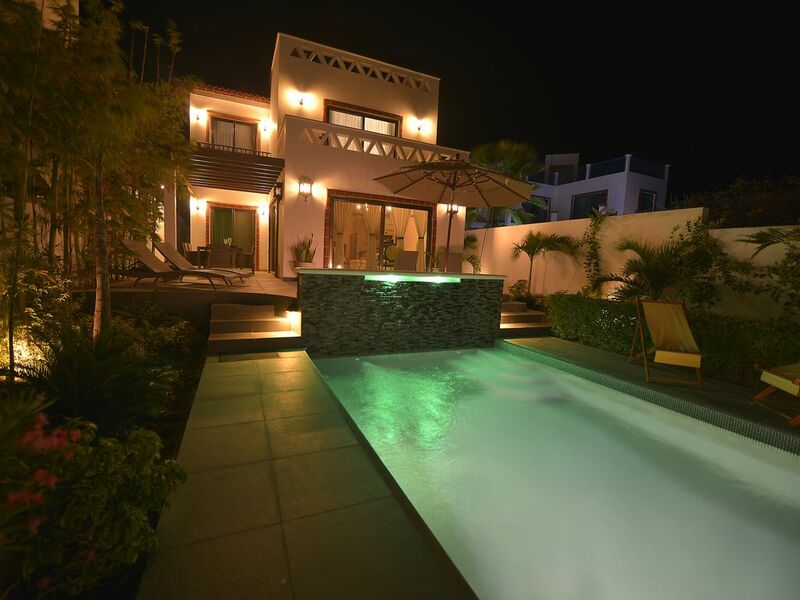 Casa Las Palmas has 3 large double bedrooms, 3 stunning bathrooms, and is fully air conditioned. This exclusive gated villa has a beautifully designed gourmet kitchen, custom made furnishings throughout each rooms, and 1000 count luxurious double bedding over double pillow high comfortable mattresses. Cedar closets and doors were mhand built with care by a local cabinet maker, and the exquisite marble floors were custom designed and hand picked in Mexico. Lavishly designed landscaping, and ornate and beautiful tilework and lighting provide an enviable and restful backdrop to the private pool and barbecue area. Casa Las Palmas provides an enchanting and wonderful experience on the island of Isla Mujeres. Great care and attention to detail. with no expense spared, has been lavished on this property to provide you and your family and friends an exclusive, relaxing Carribean retreat. As they say in Mexico, “Mi casa es su Casa.” What are you waiting for? We had a wonderful holiday in this beautiful villa, it was what we had hoped for and more. We spend many relaxing days by the pool only going into the town centre to dine at night. Everything has been thought of to ensure absolute comfort, we will definitely be booking again for next year. We stayed in Casa Candiles from the 29th January until the 8th February 2017 and what a wonderful time we had! The villa is perfect in every respect - stylishly decorated, well equipped, cool and spacious with lovely views from the upper floors. The roof terrace is perfect for an early morning coffee or aperitifs later in the day; and the garden and pool are a delight at any time. The villa is located in a quiet area but the joys of the centre of Isla Mujeres are easily accessible. The whole island is vibrant with many delicious restaurants and entertaining bars - we had so much fun exploring in our golf buggy. We will return!